As our global appetite for all things high-tech increases with the latest mobile devices and gadgets as well as the ever-expanding server/cloud market, the need to produce these devices in higher volume factories along with specialty devices at small-scale facilities lends to new environmental challenges that face the device manufacturing industry. While the manufacturing of semiconductor (silicon devices) and compound semiconductor (III-V devices) has been in laboratory and production sites for decades, it is now time to look at our environmental challenges as an industry from an abatement infrastructure standpoint. With process engineers and scientists working on the next-generation node, along come new processes and exotic materials that enable our industry/technology to move forward. Such advancements often offer new environmental considerations and challenges. Our industry has effectively used “dilution as a solution” (basic high-flow inert gas dilution, or wet, burn/wet and wet/thermal abatement systems) for a long time. However, in recent years, environmental regulations have not only expanded globally, but have also become more stringent, resulting in an increased demand for exhaust gas treatment by the semiconductor wafer manufacturing industry. This can range from particulates in the air, hazardous gases, PFCs (perfluorinated compounds), byproducts of reaction such as CO and NOx generation, to arsenic, bromides and fluorides in the wastewater. As such, “legacy” abatement solutions may need to be re-evaluated to align with trending technologies and required abatement performance. It should be also noted that conservation of natural resources (air, water, gases such as N2 and natural gas) and electricity has become a major focus and priority of our industry. CS Clean Solutions’ core competence is a unique chemisorption technology for waste gas abatement developed and in continuous improvement over the past 30 years. Our array of proprietary dry chemical media is used to capture the gases used during the manufacturing of devices. With the use of this technology, there are no emissions to air or water while safely converting the harmful gases and metal organics into an irreversible byproduct, using the principles of absorption. Reference pictorial below on how chemisorption works. 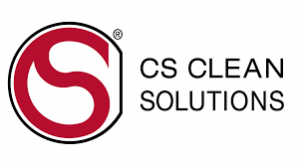 CS CLEAN SOLUTIONS engages in research, development, qualification and manufacturing of its own unique, novel and proprietary chemsorption granulates in Germany. Each granulate and column-fill scheme is tailored to the specific gas and combinations of gases to be abated. Proprietary manufacturing machinery and processing techniques offer the highest capacity and safest-to-use granulates in the industry. As part of the G450C and F450C initiatives, CS CLEAN SOLUTIONS has several ongoing evaluations underway to demonstrate dry abatement technology effectiveness related to exhaust threshold limit values of highly toxic/hazardous gases and cost-of-ownership comparisons as related to alternative (burn-wet, wet-thermal) abatement technologies. While no one abatement solution fits all applications, the use of dry-bed abatement allows our industry to continue to evolve, while ensuring we keep the process gases, arsenic, metal organics, heavy metals and other byproducts from entering the environment.